While the debate over the use of genetic modification in the production of food is still at hot as ever, in agrifood tech circles the conversation has moved on to a discussion around how gene editing technology fits into the GMO debate. “I think CRISPR and other gene editing tools mark a real turning point in the conversation,” Sam Kass, partner at Acre Venture Partners and former senior policy advisor for nutrition in the White House, told the audience of the Food Loves Tech conference in Brooklyn earlier this month. “If we’re serious about providing healthy nutritious, affordable food to everyone, in a changing climate where maintaining the status quo in food production will be increasingly difficult, this is a tool that has to be on the table,” Kass told the audience. Kass was speaking on a panel entitled CRISPR, GMO, or No: Genetics’ Role in the Food Supply alongside Marion Nestle, the author and professor of nutrition, food studies and public health, Michael Anthony, executive chef at Gramercy Tavern, and myself, head of media & research at AgFunder. The panel was moderated by Ariel Lauren Wilson, editor of Edible Manhattan and Edible Brooklyn, the producer of the event. 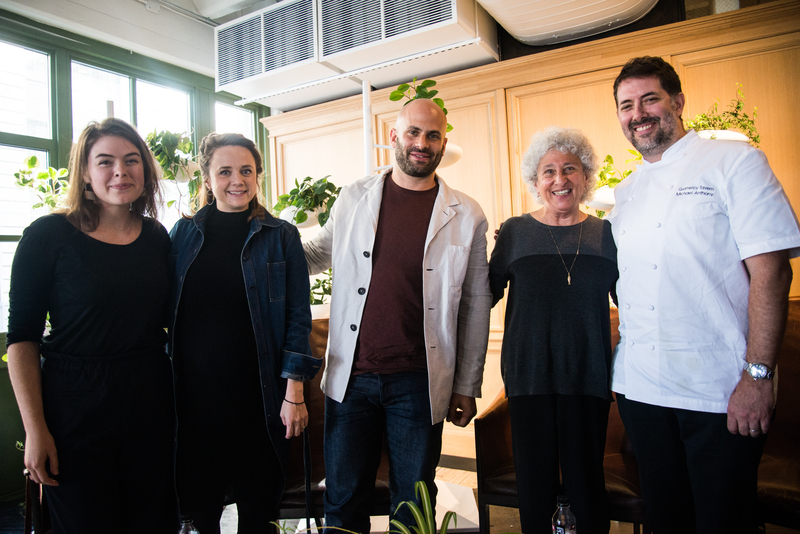 From left: Ariel Lauren Wilson, Louisa Burwood-Taylor, Sam Kass, Marion Nestle, Michael Anthony. While GMO technology — largely defined as the introduction of foreign DNA into an organism’s genome to present certain characteristics — has mainly been the preserve of large agribusinesses working on improving the yields of commodity crops like corn and soybeans, gene editing is making its way into the hands of startup businesses with different motivations. “These new technologies could enable startup companies and people with bright ideas to start doing some things that might actually help the food supply,” said Nestle. She added that in theory GMO technology could also “deal with the difficulties of food production in developing countries where there are terrible problems with climate, dryness, and nitrogen fixation” but that in practice, it’s been used to serve the interests of large corporates in the developed world where there was money to be made. Startup companies using CRISPR and other gene editing tools include Caribou Biosciences, which was founded by one of the inventors of the most famous gene editing tool CRIPSR Cas-9, is developing waxy corn; Calyxt that’s developing canola oil with a healthier fat composition and wheat with more fiber; AgGenetics, which is developing heat-resistant cattle with lighter-colored fur, and Benson Hill Biosystems that has developed a completely new tool — CRISPR 3.0 — with the aim of democratizing the use of gene editing so that smaller companies can access the technology. Instead, CRISPR edits a crop’s genome by clipping it at various places to delete or move parts of an organism’s DNA to get desired traits, a process that proponents argue can happen through select breeding, but also in nature through natural selection. The challenges for the gene editing community now is communicating with and educating the public, something that the industry failed to do properly with the advent of GMO. In the hands of a small number of multinational businesses serving a small subset of the world’s farmers, public education, and communication around what it is and what it means has been very limited, and this has caused a big problem for the reputation of the technology. “They have been able to do whatever they want to do with what I think has been very little regulatory oversight, and they’ve controlled the food supply,” added Nestle. “This has to be a completely transparent conversation,” Kass added. I told the audience that startups like Benson Hill Biosystems were keen to engage with the public and help them to understand how these tools are used in different circumstances. “It’s about when, where and how this technology is used; it’s not helpful to think of it as a yes or no question,” I said. The nuances of using genetic engineering, whether GMO or gene editing, can be highlighted by the situation in Hawaii. The island voted to ban all GMO crops in 2014, but then later made an exception for the Papaya fruit because GMO technology had become essential for farmers to combat a deadly pest capable of completely wiping out its crop. One of the main criticisms of GMO relates to the development of crops capable of resisting herbicides, which results in farmers spraying more chemicals on their land. This results in herbicides washing into local waterways, damaging local ecosystems as well as making their way into drinking water with some serious health concerns. Roundup Ready corn is one of the main culprits because critics say it was designed by Monsanto to sell more of its branded herbicide Roundup. So the commercial motivation is also questionable, according to critics. But arguably GMO papaya is an example of the technology being used in the right way as it’s a lifeline for many Hawaiian papaya farmers. Kass added that both GMO and gene editing could be used to increase the nutritional profile of fruits and vegetables for the better. “It’s a nuanced situation,” I said. “In some circumstances, the technology makes sense and is not being used by large ‘evil’ corporates to manipulate the food supply.” I can see a world where consumers choose to eat a genetically modified or CRISPR edited vegetable because they know it has an improved nutritional profile or the way it’s grown has no adverse impact on the environment. But that same consumer might choose not to eat GMO corn because it’s promoted the overuse of chemical herbicides. This world won’t be possible without more consumer education, however. Looking forward to the growing use of gene editing technologies, the panel expressed other concerns of unintended consequences, particularly related to the relatively low price of the tool and lack of regulation. Kass and Nestle both detailed the cumbersome nature of the current regulatory regime for GMO— where one of three different bodies might be responsible for approving the use of the technology — but also added that there was ultimately relatively little oversight because of the messy system. I referenced plans by some gene editing startups like Benson Hill Biosystems to create a responsible coalition of companies using these tools in an effort to regulate how they’re using them among themselves, and be transparent and clear with the market about how and why they’re using them. But even they understand the need for some official oversight and regulation, argued Kass. However, if the government starts to regulate gene editing, as new moves by the USDA indicate they might, a balance needs to be hit where the regulatory process doesn’t become too expensive and thereby a barrier to entry for younger companies that are motivated in other ways to the large agribusinesses. “Finding the right balance where you’re not giving an advantage to the bigger players is a complicated thing,” said Kass. What do you think about the future of genetic engineering? We want to hear from you! Email [email protected].